Branger_Briz in collaboration with Brannon Dorsey debuted Probe Kit at the eMerge Americas Conference, as an activist “artware” installation aimed at illustrating how simple it is to collect personal network data and how much can be inferred from that data. Sarcastically pitched as an “amateur data collector kit”, Probe Kit turns your wifi card into a “net” that catches the fluttering probe requests (data packets) emitted from the wireless devices of the people around you. One of the most valuable currencies of our era is personal data, despite this fact many of us don’t really understand what this data is, how it’s collected/exchanged and how it’s turned into wealth. Data security is a low priority for much of the popular software and hardware we use today, for this reason it isn’t difficult for institutions (large and small) with the right tools to collect and leverage much of your personal information. Probe Kit demonstrates this by specifically collecting one type of network data: probe requests, the small messages your wireless devices broadcast to connect to known WiFi networks. 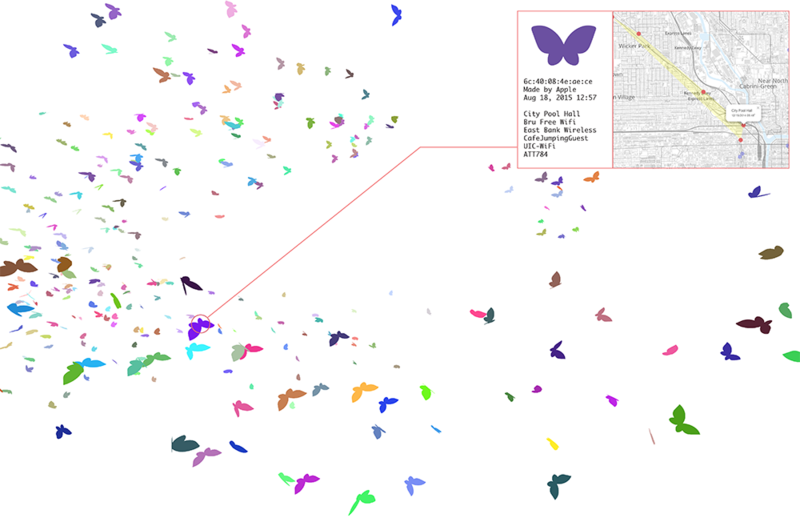 By collecting and algorithmically organizing this data and then cross referencing it with other datasets we can create a profile (visualized as a butterfly) of each device around you which includes all the networks that device has ever connected to along with an interactive map charting where these networks exist (i.e. where this person lives, works and plays). 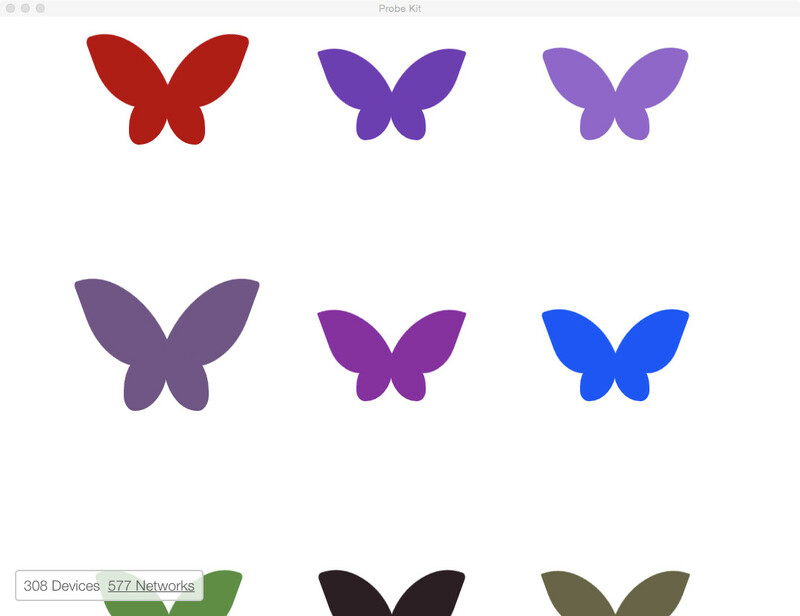 Captures probing devices in the vicinity and uses their MAC address (its unique identifier) and WiFi network list size to generate a unique butterfly. 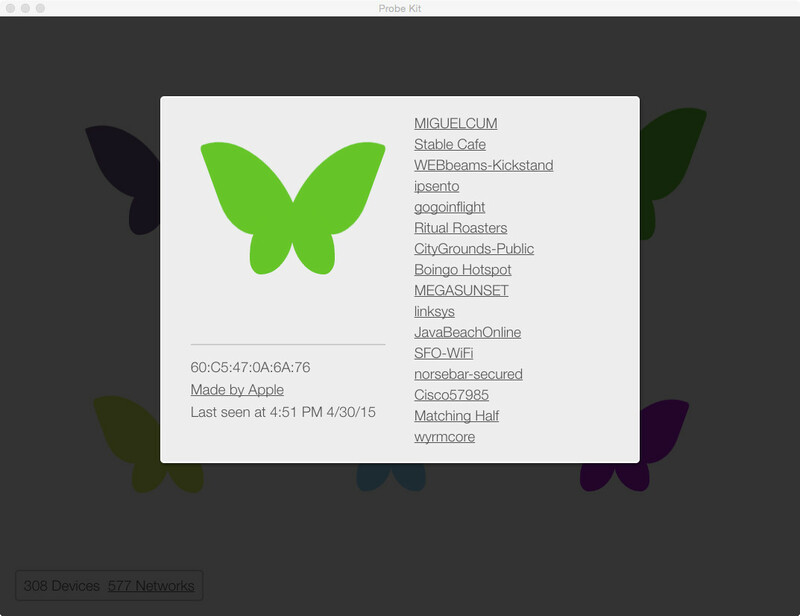 Displays MAC address, vendor info and associated WiFi networks list. 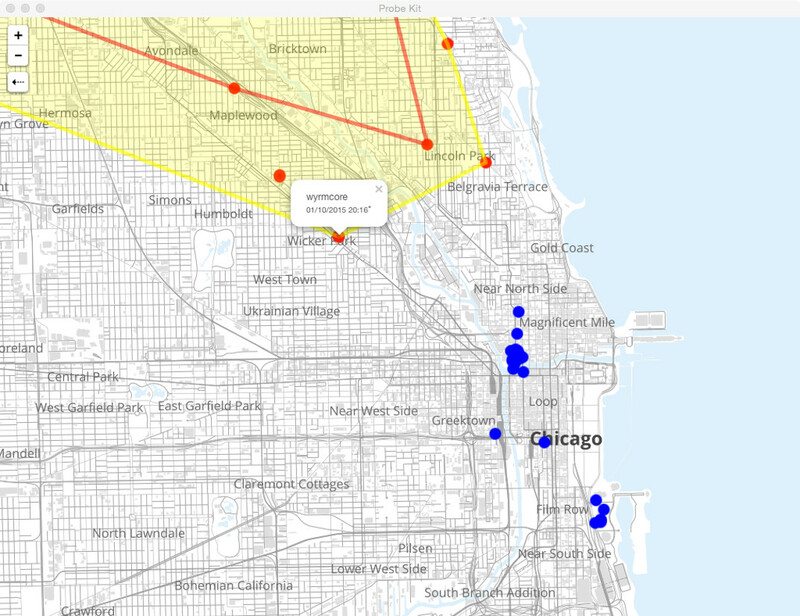 Cross references your collection data with geotagged ( war driven ) wireless router beacon frames. Probe Kit debuted at the eMerge Americas Conference in Miami Beach and will be included at the International Symposium on Mixed and Augmented Reality in Fukuoka, Japan. 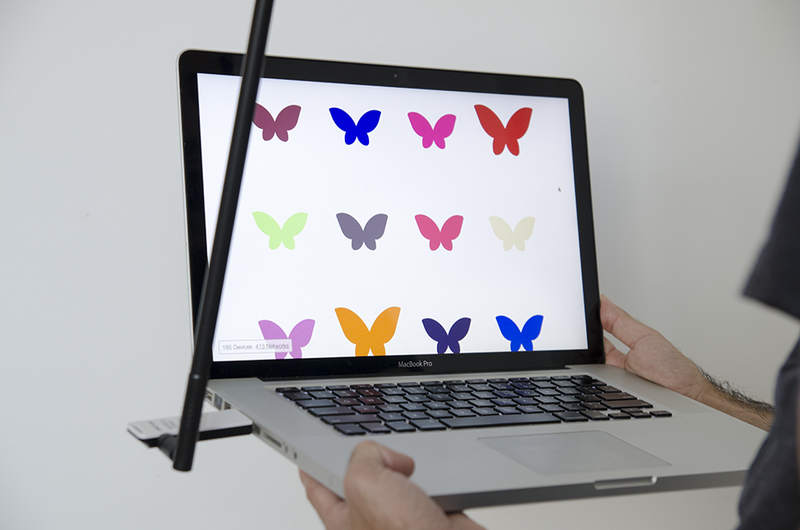 A computer with a 9 dbi omni WiFi antenna collects probes from devices in the area while simultaneously spawning a butterfly per device in a projected “habitat”. 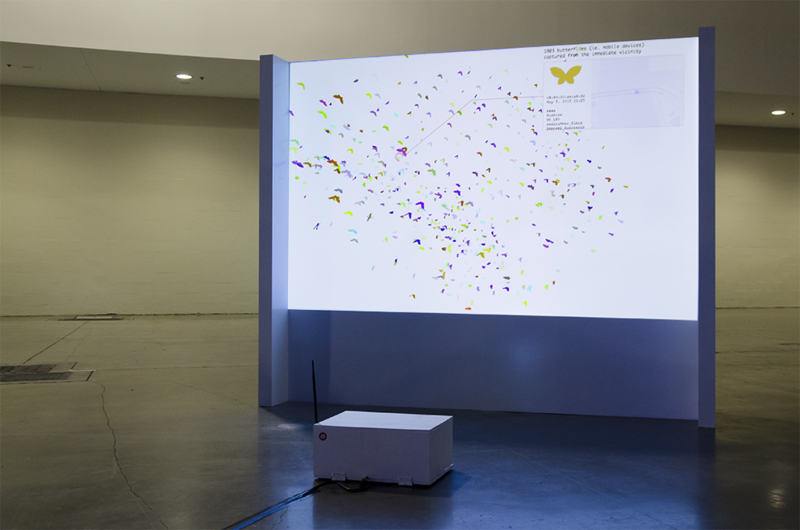 This installation view displays all the butterflies (devices) in a 3D space and scans for new devices and details their network list, map and related metadata. Over 5000 devices were collected at eMerge in Miami and displayed in this way. The “Network Data Safari” is a performative workshop where participants are given a copy of the Probe Kit app as well as “field guides” which explain how the app works. Participants take their laptops out into wild urban landscapes to capture probing devices and create their own network data collection. At the end of the safari participants are encouraged to bring their laptops back to the installation to “release” their collection into the installation’s “habitat”, amassing an even larger data set. Branger_Briz is a group of artists, educators && programmers bent on articulating our digital landscape, creating memorable interactive projects for ourselves && our clients. Brannon Dorsey is an artist who uses computational technology and reproducible electronic media to explicitly challenge digital consumption. Probe Kit is open source + cross platform builds will be available for download soon.